J. 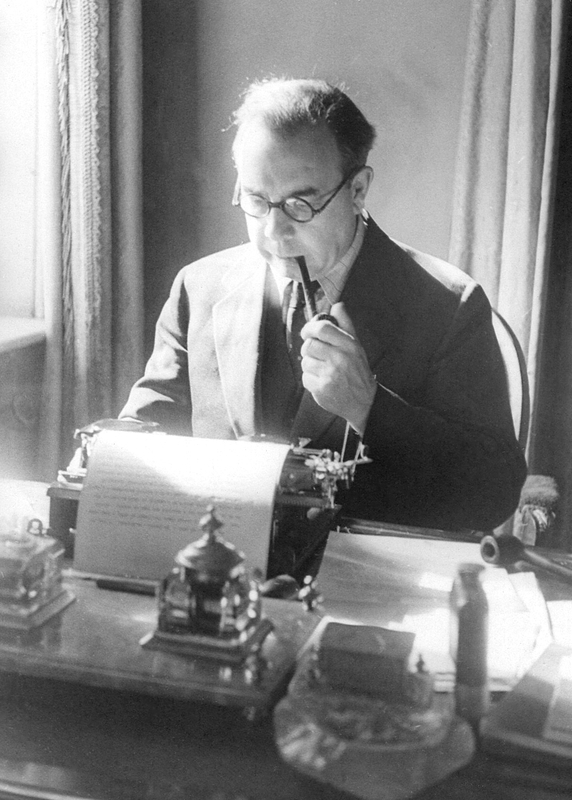 B. Priestley (born as John Boynton Priestley in Bradford, West Riding of Yorkshire, England, died in Stratford-upon-Avon, Warwickshire, England) was a famous Writer from United Kingdom, who lived between September 13, 1894 and August 14, 1984. He became 89 years old. John Boynton "JB" Priestley was a British socialist, social commentator, columnist, author, playwright and radio host. When Priestley was 20 years old he enlisted in the British Army to fight in World War I, but after having been wounded in battle hard in 1916 he abandoned a military career and focused instead on a career as a journalist. During the rest of his life he would be a great advocate for peace, something that also would later influence his writing. He was also a committed socialist and it shows in his writing, not least in his plays. In 1929 came his breakthrough as a author with the novel "The Good Companions" that made him famous even outside the UK. During World War II he worked as a very successfully radio host, and he had as much as 16 million listeners, only the Prime Minister Winston Churchill had more. But after a few years the broadcasting was stopped because Churchill believed that Priestley was too leftist. During the postwar period he openly showed supported the Soviet Union in the increasingly bitter political struggle between the Eastern and Western blocs, but denounced both the Korean War and the Vietnam War as they increased production of nuclear weapons. He was among other things, co-founded the Campaign for Nuclear Disarment (CND), in 1958th Priestley was offered to become ennobled several times but declined each time. But in recent years, he accepted the prestigious Order of Merit. Preistleys literary works are often characterized by his radical political views, he runs often with the upper class and conservative thinking. He was fascinated even time as a concept and how it affects people. He picked among other great inspiration from time-theorist JW Dunne, whose theories were the foreground to play Man and Time. He developed several other pieces after this, including in An inspector Calls. These pieces is often called "Pristleys Time Plays". Total Priestley wrote 121 novels and some 50 plays. In September 2008 the new book by Priestley came in the stores, it's a collection of letters he wrote from the trenches during the First World War. He died at his home in Stratford-upon-Avon in 1984, 89 years old. He is born under the zodiac virgo, who is known for Analyzing, Practical, Reflective, Observation, Thoughtful. Our collection contains 30 quotes who is written / told by B. Priestley, under the main topics: Age, Humor. "The more we elaborate our means of communication, the less we communicate"
"The greater part of critics are parasites, who, if nothing had been written, would find nothing to write"
"I never read the life of any important person without discovering that he knew more and could do more than I could ever hope to know or do in half a dozen lifetimes"
"I have always been delighted at the prospect of a new day, a fresh try, one more start, with perhaps a bit of magic waiting somewhere behind the morning"
"Comedy, we may say, is society protecting itself - with a smile"
"Be yourself is about the worst advice you can give to some people"
"Accidents, try to change them - it's impossible. The accidental reveals man"
"A novelist who writes nothing for 10 years finds his reputation rising. Because I keep on producing books they say there must be something wrong with this fellow"
"Britain, which in the years immediately before this war was rapidly losing such democratic virtues as it possessed, is now being bombed and burned into democracy"
"I know only two words of American slang, 'swell' and 'lousy'. I think 'swell' is lousy, but 'lousy' is swell"
"In plain words: now that Britain has told the world that she has the H-Bomb she should announce as early as possible that she has done with it, that she proposes to reject in all circumstances nuclear warfare"
"If you are a genius, you'll make your own rules, but if not - and the odds are against it - go to your desk no matter what your mood, face the icy challenge of the paper - write"
"If we openly declare what is wrong with us, what is our deepest need, then perhaps the death and despair will by degrees disappear"
"Public opinion polls are rather like children in a garden, digging things up all the time to see how they're growing"
"Perhaps it would be better not to be a writer, but if you must, then write"
"Our trouble is that we drink too much tea. I see in this the slow revenge of the Orient, which has diverted the Yellow River down our throats"
"Marriage is like paying an endless visit in your worst clothes"
"Many a man is praised for his reserve and so-called shyness when he is simply too proud to risk making a fool of himself"
"There was no respect for youth when I was young, and now that I am old, there is no respect for age, I missed it coming and going"
"There are plenty of clever young writers. But there is too much genius, not enough talent"
"The greatest writers of this age... are aware of the mystery of our existence"